Chandrababu Naidu never tires of talking about the Telugu women pride and always fancies himself as Chandranna. But, he did not baulk even for a second to campaign against a Telugu woman in Karnataka's Mandya LS constituency. This act of his is drawing flak from all quarters. He has gone all the way from Amaravati to Karnataka just to work against a Telugu woman. He has gone to campaign against actress Sumalatha, who is contesting as an independent candidate from Mandya. Sumalatha is a popular Telugu actor with several hits to her credit. She made a name for herself in Kannada too and settled down in Karnataka after marrying Kannada superstar Ambareesh. She has always been maintaining good relations with the Telugus despite settling down in Karnataka. Yet, Chandrababu chose to campaign against her. Interestingly, there aren't many Telugus in Mandya and Chandrababu cannot work any magic in the constituency. Yet, he had gone there to score marks from Devegowda family. But, the fact is that there is a ground swell of public support for Sumalatha. At such a time, why should Chandrababu campaign against her? The mood is in her favour and she is touted to win from Mandya. Should Chandrababu chose to campaign there at such a time? Sumalatha herself is making light of Chandrababu's campaign saying this will have no impact whatsoever. 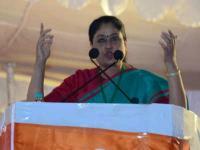 × RELATED Vijayashanti To Campaign For MK In Karnataka!